Exuding grace, finesse and exhibiting lightning speed; the cheetah is an elegant solitary cat that differs greatly from its big cat counterparts. This spotted cat doesn’t possess the strength of lions and leopards, and is (technically) classed as a diurnal hunter. While leopards and lions thrive under the cover of darkness, cheetah prefer to grab their moving meals at dawn and dusk when the air is cool, the light is right and the competition is minimal. 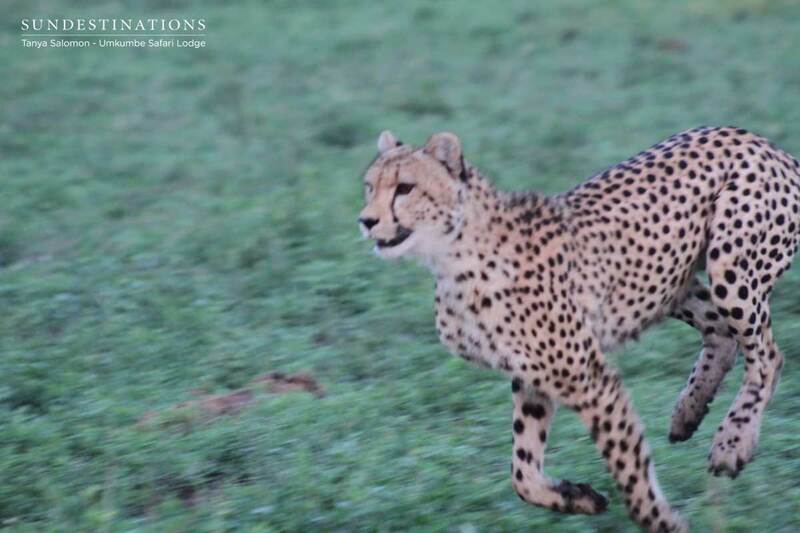 We’re quite used to receiving reports of leopard sightings from the team at Umkumbe Safari Lodge, but the other day, reports of a couple of cheetah on the hunt for food came flooding through the airwaves. 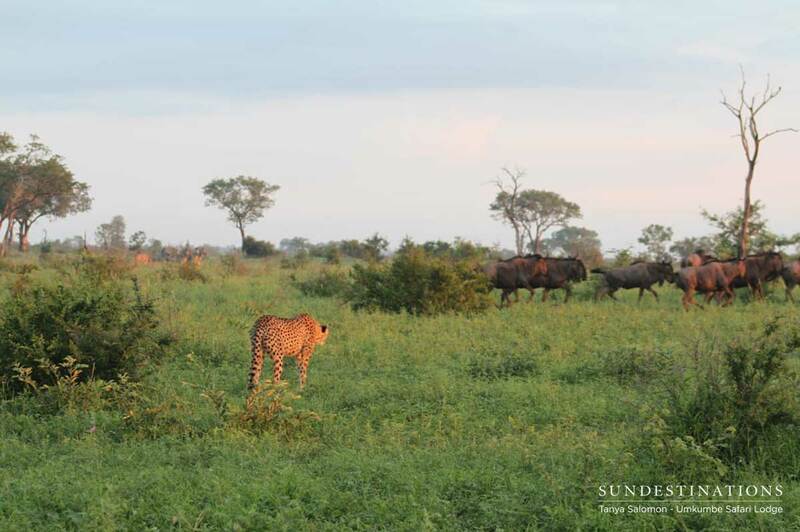 Guide Tanya sent through a few images of their recent sighting. There was a perfect visual of two slender cats attempting to target one of the smaller and weaker calves in a wildebeest herd. Cheetah aren’t prepared to put up a fight for their food, and can’t afford to take the risk of retaliation from feisty prey. They don’t have the strength of other cats – they’re all about speed and not power. This is why they target small, manageable prey and will walk away from any sizeable species that looks like they could inflict injury. Swift, simple and easy is how a cheetah likes to conduct its kill. 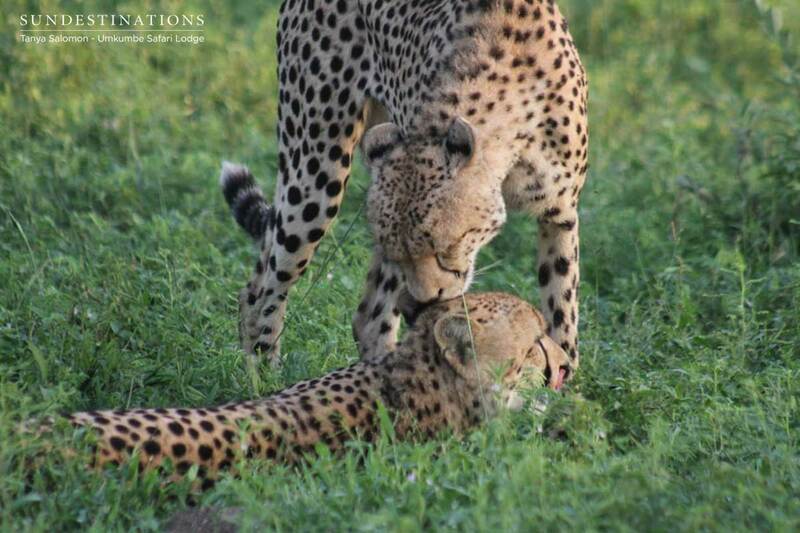 Put simply – cheetah don’t like to fight. Cheetah also tend to eat quickly, and quietly. Their lack of strength means that they are unable to drag their prey into the high reaches of trees to keep it out of the way of scavengers. As a result, they need to be stealth like about their dinner table habits. Cheetah tend to hunt in coalitions, catch their prey, pause to catch their breath and then tuck into their gory delights. While one eats, the other one surveys the landscape for thieves. Hyena and other opportunistic feeders tend to be active at night, so cheetah are generally quite safe from the food thieves. 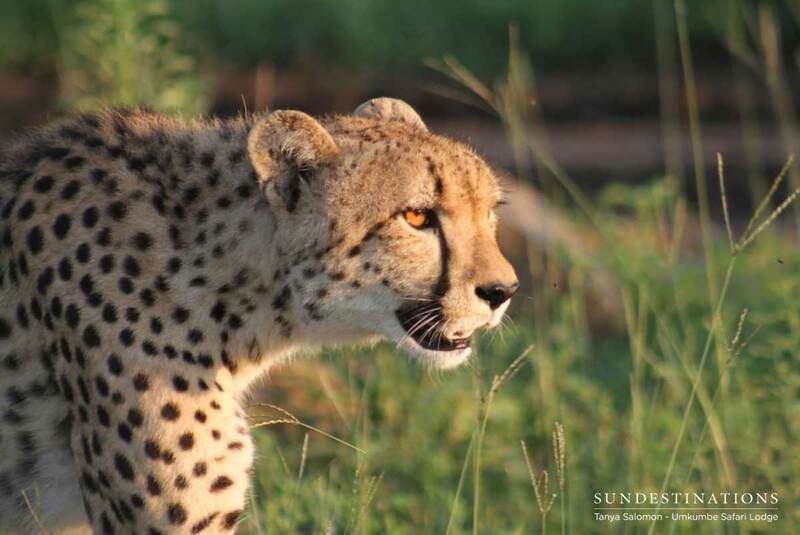 Tanya speculates that the two cheetah were a young male and female, which could actually be the sub-adults that were spotted a while ago. However, this time they were without their mother. Littermates tend to leave their mother’s side after 2 years, and then stay together for at least 6 – 8 months afterwards. In truth, cheetah aren’t particularly successful hunters until they reach the age of 3, so it’s quite possible that these two youngsters are within that age bracket. 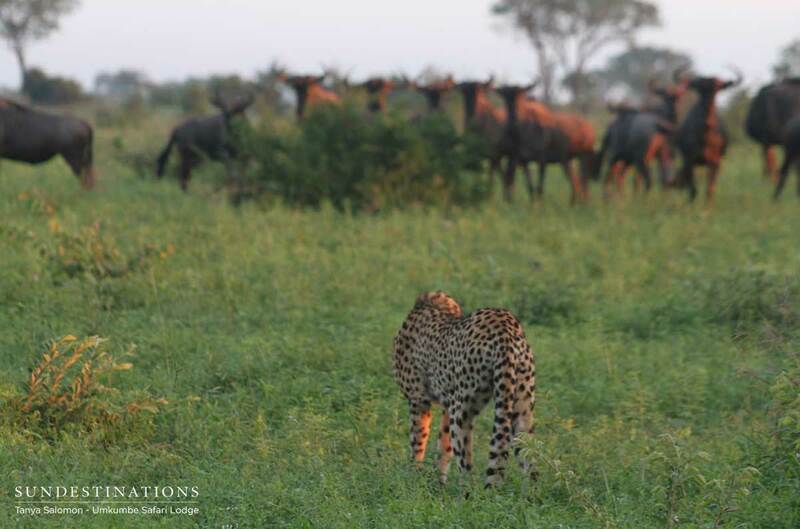 Despite the unsuccessful kill, the cheetah sighting proved to be an absolute win for both guides and guests!